This was one of the sets I got free for attending convention. It's called Inspired by Nature. It has this really great "grassy image" and then this big image of three coneflower type flowers. What I love about these flowers is they can be so many colors. They can be the Black Eyed Susan types with yellow petals and big brown centers or they can be purple like my purple coneflowers in the backyard. I've seen so many different varieties of this flower which is why this set so versatile. For this sample I chose to experiment with two of our new "In Colors". I really love Pink Pirouette this year. It's just a beautiful shade of pale pink. Paired with the Riding Hood red, they make a stunning combination. 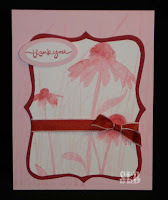 For this piece, I inked up the "grass" with the Pink Pirouette and stamped off and then stamped it on Shimmery White. Then I inked up the flower stamp with Pink Pirouette then I took a sponge dauber and sponged some of the Riding Hood Red on the top of the coneflower. It gives it some depth and a really nice shaded look. This sample also uses the new, Stampin' Up! exclusive Big Shot die called Top Note. I love this die, it makes such a nice little frame for this card! All products from Stampin' Up! This is a great set!! I love the new pink pirouette also! Your card is lovely!